Super Jesus Club is the name for our events with children on Sunday mornings during Church. The children are with the adults for 15–20 minutes before moving to the Stable Rooms for their own exciting programme. On the first Sunday of the month we have an All Age Service in the church. 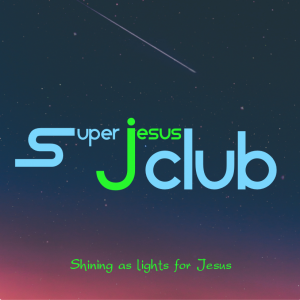 SJ Club is the name for our events with children on Sunday mornings during the 10.45am church service. The children are with the adults for 15–20 minutes before moving to the Stable Room for their own exciting programme. We have a combination of times all together with the 5–11s for singing, praising, birthdays and sharing what we have done, time in age groups for sharing the Bible story and time to choose from a variety of Zones one that suits the way that they wish to respond. We aim to enable the children to have meaningful and memorable encounters with God and to encourage the children to think about bible stories and scripture for themselves, asking questions and finding meaning, developing their own spiritual toolkit as we ride the Jesus trail together. On the 1st Sunday of the month everyone stays in church for our 50 minute All Age Service. We welcome you to come along on any Sunday morning. Why not give it a try? SJ Club is led by Tim Blake and a team of experienced children’s workers who are checked with the Disclosure and Barring Service and receive ongoing training in their work. For under 3’s. The Seedlings team is led by Deborah Evans and is a mixture of free play, guided play, stories, singing and crafts all played out within a caring environment that values each and every child. The Seedlings team includes; Nic Nevin and Zoë Shuler. Seedlings meet in the crèche downstairs in the Stable Room. For Nursery and Reception children. The children enjoy acting out Bible stories, singing, playing and making. They are cared for by a variety of older and younger people who help them to see that a loving God made them and the world we live in. The Acorns team includes Liz Crook and Rachel McKinley. For children in school years 5 and 6. The children explore the truths of the Bible, and what this means for them, through games, discussion, drama, crafts and much more. The Strawberry Juice team includes; Eileen Smallwood and Chris Cox.